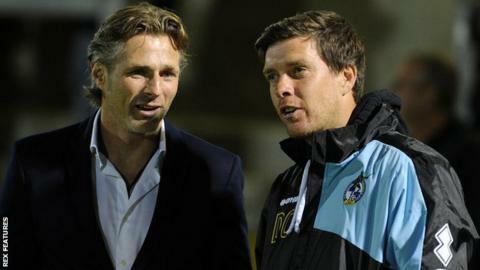 Boss Gareth Ainsworth says Wycombe are "pretty much on track" despite League Two being "tougher" than last season. The Chairboys are 12th in the table having reached the play-off final last term. "It's going to be a tougher league than last year. There's bigger spending teams this year - Portsmouth, Leyton Orient, Oxford - plenty of resources," he told BBC Three Counties Radio. "Once again we're not leaving anything out on the pitch." He continued: "The culture that (chairman) Andrew Howard and myself have tried to bring to this place is apparent now and the fans are right behind us." Wycombe have not played a league match since 31 October because of the international break and an FA Cup victory at Halifax. Ainsworth's side go into Saturday's trip to AFC Wimbledon with two games in hand of most of the teams above them. "It's been a decent start, a couple of games that have been called off really have disrupted our plans and what we wanted to put in place," said Ainsworth. "The word professional comes into it now and we have to deal with Saturday-Tuesday games coming through the December period. "We have six points in hand, if we can take half of those we'll be sitting fifth or sixth now and that would be a very comfortable start for Wycombe fans and management."